Scoopable litter produces a fine dust that aggravates allergies. Clumping cat litter is a real blessing when you don't have much time to clean or hate changing out the litter all the time. The downside, though, is that it is known to trigger allergies, both for people and for felines. 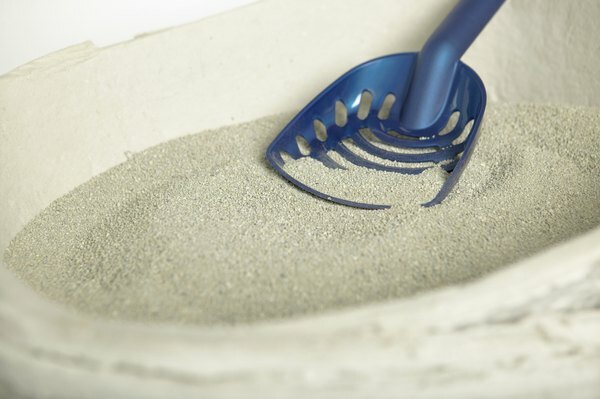 Scoopable cat litter is made up of fine pieces of clay. The clay pieces produce a very fine dust that floats into the air each time the litter is disturbed. Every time you scoop, add or change litter, you breathe in some of the dust. Plus, every time your cat uses the litter box, he stirs up some dust too. This dust doesn't bother some people, but for others it triggers an allergic reaction. In some cases, people are so allergic to the clay litter dust that they think they're allergic to their cat. Besides the fine dust, many litters have added scent. These scents can trigger allergies on their own, or may make existing allergies feel worse by irritating sensitive mucus membranes. Just like the clay dust from scoopable litter drives some people's allergies wild, some cats have allergic reactions too. If the litter box is enclosed, it can be even worse, since it gets concentrated into a small area. To add to the problem, your cat gets a second dose of the dust when it lands on his fur and he later has to groom himself. Even shaking it off can trigger an allergic reaction. The key ingredient for making litter scoopable is sodium bentonite. In addition to the clay dust, fine particles of this ingredient are easily breathed in by people and cats when they're near the litter box. Both are often allergic to the sodium bentonite. Also, just like the clay dust, the sodium bentonite often settles in your cat's fur, carrying it throughout the house. Natural, low-dust, non-toxic cat litters are the best alternative for people or cats with allergies. Litter made from corn, wheat, wood chips or recycled newsprint is usually less irritating to allergy-prone cats and humans than traditional clay litter. Also, look for litters that don't have any scents or perfumes added. This alone can often relieve a lot of litter-related allergy problems.